The Historic City of Ayutthaya covers the remains of the second Siamese capital. It represents the birth place of true Thai art, including wall paintings, and architecture. Ayuthaya succeeded Sukhothai (another World Heritage) as capital of Siam (now Thailand) during the 15th century. 417 years later, Bangkok took over from Ayuthaya. The income of the city came from agricultural products, and from duties levied against foreign trade. From the 16th century, European visitors from Portugal, France, Holland and England were received in Ayuthaya. The Europeans were very impressed at the wealth they encountered. At its height, Ayuthaya was one of the most important trading centers in the area. In 1767, as a result of 2 years of war, Ayuthaya was conquered by the Burmese army. They destroyed everything that was sacred to the Thais. The city became abandoned, and fell into ruins. Ruins here really mean ruins. The former splendor is not easy to recognize, though the now red stone statues have their own charm. From the two former capitals that are now World Heritage Sites, I prefer Sukhothai. Actually, from all Thai capitals in history I prefer Bangkok. When will this city become a World Heritage? I visited this WHS in December 2017 as a day trip from Bangkok. Being quite easy to reach by taxi, it is always pretty much crowded unlike Sukhothai. in the 18th century it also suffered extensive damage by the Burmese, so what is left today is pretty much ruins on quite a large scale. The restoration works seem much worse than Sukhothai with total reconstructions, additions, restorations with reinforced concrete and iron railings on some of the few chedis and stupas which tourists can climb. However, what I disliked most was that there is no actual buffer zone or restricted area for vehicles and few parking spaces so it was not unusual to see SUVs driving literally over the lower city walls. The patchwork of roads were surely built right on some of the most ruined temples so it is actually quite difficult to appreciate Ayutthaya as an ensemble and it is much more difficult to visit both on foot as well as by the shuttle-shaped tuktuks. There are all sorts of dos and don'ts but nothing against the use of loudspeakers by tour guides which are really a nuisance for all visitors (including the tour groups themselves!). That said, I managed to enjoy the site by using a set of earphones and an audioguide and headed towards the perimeter of most stupas and prangs instead of the main pathway. At Wat Mahathat, I bought a combined ticket for 6 wats, namely: Wat Mathathat which houses the Buddha head in the Bodhi tree, Wat Phra Ram and Wat Ratcha Burana which have a few mural paintings, Wat Phra Sri Sanpeth (photo), Wat Maheong and Wat Chai Watthanaram (which is actually not part of the inscribed WHS). This ticket together with many other free wats and remains which you'll eventually visit on your way from one wat to the next, gives you the opportunity to get a good overview of the different buildings and styles of Ayutthaya. The UNESCO WHS inscription plaque is can be found close to the entrance of Wat Phra Sri Sanpeth, opposite the Wang Luang/Royal Palace. I'm glad I visited this WHS but after my visit I would find it hard to place it in my top 200 WHS (unlike Sukhothai). A short drive north from Bangkok lie the ruins of the Historic City of Ayutthaya, one of Thailand's first three World Heritage Sites, inscribed 25 years ago. 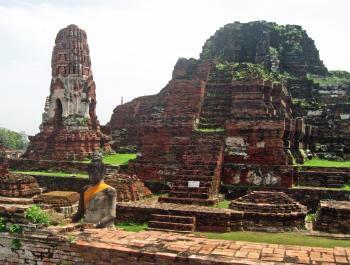 As has been noted, Ayutthaya was of the former capitals of Siam, and, like Yogyakarta in Indonesia, was named after the Indian city believed to be the birthplace of Rama, hero of the Hindu epic "The Ramayana". I visited Ayutthaya as a day trip from Bangkok in the fall of 2012, and enjoyed the opportunity to walk around the ruins of the ancient city. The city was built on an island, and I'm curious how often it was flooded during its time as a capital, since portions of the site were being drained from flooding during my visit. I appreciated the vegetation which provided a natural contrast to the red brick prangs of temples like Wat Matathat, and occasionally grew over some of the statues, including a head of Buddha which had been overtaken by a tree. Ayutthaya was inscribed for the Thai art and architecture embodied in the palace and temples of the city; although the city is now mostly in ruins, you can still sense the grandeur that must have existed when it was the capital of Siam. Logistics: Ayutthaya can be reached by car, as well as by bus and/or boat tours, from Bangkok. The former capital of Thailand for more than 400 years is truly a tragic reminder of war time destruction that changed one of the most luminous cities of Asia to become fractions of brick ruins that its past glory can be seen from the beautiful old part of Bangkok which reportedly to be a small copy of Ayutthaya. I revisited the city after 18 years from my first visit to see that how much change of this historical park can be. Similar to the first time I saw this city, I am disappointed since most of the city areas are just a typical city in Southeast Asia with modern western styled buildings, and the city is expanding in every directions. I started to see ancient stupas surrounded by modern complexes or even in the middle of large circle. Anyway these historical ruins are not part of World Heritage Site listed of Ayutthaya Historical Park which covered an area almost half of the river island only. The first place I revisited was the ruins of Wat Phra Sisanphet, I noticed that a lot of changes happened in the area around the carpark, decades ago there was no carpark and we had to park along the street with chaotic souvenir stalls. 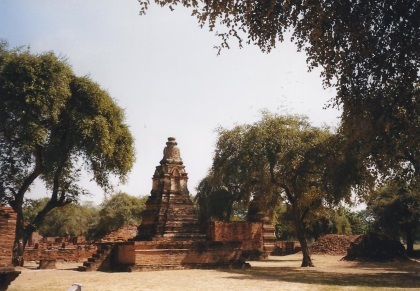 The ruins are still beautiful with iconic three stupas. The most visible change is the group of tourists, almost twenty years ago most of tourists are Western Europeans, but now most of them are Chinese tour groups, field trip local students and Japanese who preferred to bike around the city. The nearby rebuilt Wat Mongkol Bophit is decaying and need restoration especially for the roof. Unfortunately that one of my favourite temple during my previous visit, Wat Ratchaburana is currently under preservation and reinforcing, as a result I did not have a chance to explore the famous treasure crypt. Nevertheless I saw those golden treasures in the nearby National Museum. Most of the ruins on the island are gigantic Buddhist temple which built in different styles during the long history. While most are revisiting trip, I managed to saw couples of new sites. Two of most interesting sites are Wat Lokkayasutharam which has big reclining Buddha and Wat Phra Ram, the oldest temple in the city island. Then I visited historical sites outside the island which are not part of World Heritage Site but in my opinion these sites are equally and even more superiors in terms of architectural and historical values. The first place was Wat Na Phra Meru, the only temple that survives the war destruction; the chapel building with inside Buddha image is extraordinary beautiful. Wat Phukhao Thong, the biggest stupa of Ayutthaya which is scarily leaning. The impressive complex of Wat Chaiwattanaram, possibly is the most stunning sight of Ayutthaya temples that built to commemorate the victory on Angkor. Wat Phanan Choeng, originally built before Ayutthaya, has the most stunning giant golden Buddha Image in Asia. Museums of foreigner settlement of Portuguese village, Japanese village and Holland village for Dutch history are also very interesting with good story of trade routes and their lifestyles in Ayutthaya. Riding an elephant to see the ruins are also interesting but I would prefer bicycle, like most of Japanese tourists did, since more area can be explored, but the best way maybe the infamous Tuk-Tuk if you want to see all ruins outside the island. Overall, Ayutthaya is a nice place to see Asian ancient city, while the site itself cannot compare with Angkor or Sukhothai for grandeur building and surroundings, the significance of Ayutthaya in term of history as regional power house is undeniable. Since Thai government and UNESCO finally changed the typo error of Ayutthaya to delete the confusing “and associated historic towns”, I hoped that one day the World Heritage Site zone will expand to include all important historical ruins outside the island and the ruins of nearby city of Lopburi, which was the second capital, with its unique Persian-Ayutthaya styled palace and French buildings as a part of extension not only for protection but the whole complete story of vibrant Ayutthaya history. I visited the Ayutthaya site in April 2015 as a day trip from Bangkok. I took a private taxi to get there and take me around to be able to see as much as possible. The UNESCO sites are on the island only; and not even all on that island are UNESCO. I saw the most important, but also two great sights outside the island. The heat was extreme, but the temples were great. They have done a lot of restauration in the last years and everything is wel kept. Of course, it's ruins, but they are great. A lot was also build of wood which of cours eis gone, and also most relics you cannot see and the paintings inside the temples you cannot access too. A great place for a day trip from Bangkok. please see my website for more photo's and the route I took on a GPS map. 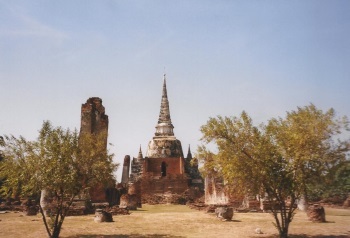 I have visited the world heritage Ayutthaya in May 2004.Before visit this place i have little knowledge on it.I enjoyed the place and learn about the history. The challenge posed by this site is to make sense out of the scattered remains of the capital of a former strong Southeast Asian empire. Its complete name Phra Si Nakhon Ayutthaya only suggests the reverence and significance Thais generally identify with to the ancient city. I agree with Els that ruins here are really ruins - it's a bit sad that this site was utterly devastated during the Burmese siege. The present condition of this site does not, in any way, give justice to how it used to be based on historical records and accounts, descriptions and praises, and even map renditions. However, I believe that its current state still holds a distinct charm and mystery for WHS enthusiasts and regular tourists alike. Upon arriving Ayutthaya, my agenda there was not really clear: either I visit the WHS-inscribed sites only, or just choose some major ones and pay those other great temples --that didn't make it to the inscription -- a visit as well. Eventually, I decided to do the latter. Much to my surprise, two temples that are not inscribed left me with really strong impressions: Wat Yai Chaimongkon and Wat Chaiwatanaram. Among the inscribed temples, however, Wat Rachaburana probably offers the most unique experience with its 2-tiered chambers and few remaining old murals inside the principal prang. Although the scales of Wat Maha That and Wat Phra Si Sanpet are impressively grand, these being largely in ruins, it was hard for me to reconcile the fact the these two sites were the most important -- socially, politically, and religion-wise -- during the peak of the Ayutthaya empire. 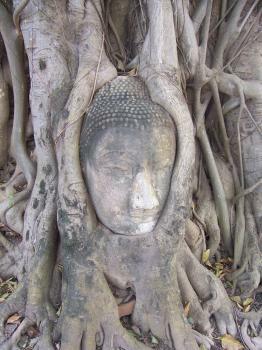 Nevertheless, seeing the Buddha head entangled among the roots of a tree in Wat Maha That was among the highlights of the trip. I also managed to visit other temples such as Wat Phra Ram, Viharn Phra Mongkol Bopit, the ruins complex where the elephant rides are being executed, among others. If there's one thing I like most about Ayutthaya, its how the temples and other monuments are really taken care of despite their conditions - I mean, it's really just the best -- and the only! -- thing that they can do with whatever remains standing (or leaning, falling, collapsing). I visited this site in February 2012. Floods occurred a few months ago and some traces are still viewable, however the authorities are working to preserve the splendor of the place. 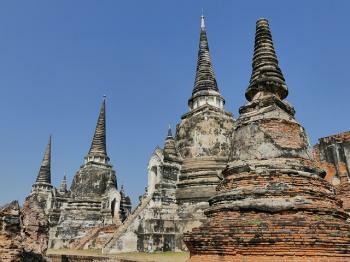 The historic center of Ayutthaya was founded during the 14th century and became the capital of the Ayutthaya kingdom. The capital was destroyed by Burmese armies and given up since the end of the 18th century. Nowadays, the historic site consists of numerous buildings, more or less well preserved, scattered throughout the city and out. This site is one of the better examples of the Thai art and of a Southeast Asian ancient city. Not too far from Bangkok (two hours by van), it's possible to visit major sites in one day or two. This was my first Asian WHS so it will have a little bit of a special place for me. There are quite a few different ruins and temples to visit within the central area, each charging a separate admission fee. My favourite site was the first one I visited Wat Ratururana which had an impressive cluster of chedi's. The central one was particularly impressive as you could not only climb up it but also descend inside to see a small but impressively decorated chamber at its very heart. I spent the best part of an afternoon dotting between the main sites, meeting fellow travelers and enjoying a relaxing stroll through the water lined park behind Wat Prah Mahathat. A week or so before I visited there had been pretty extensive flooding in the area and there were still a fair few places that were underwater. This meant I didn't get to visit any of the wats off of the central island. However it was very heartening to see that there had seemed to been a pretty good response from the local authorities to aid those affected by the flooding. This was a really good day trip to make from Bangkok, and the sites seemed reasonably impressive. 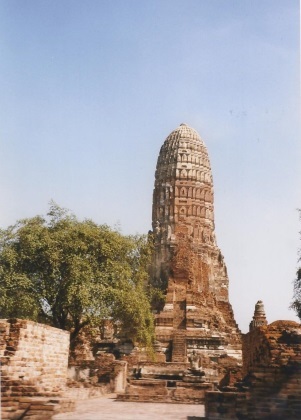 Ayutthaya has abandonned stupas from subsequent empires and buddhist styles. The city must have been very impressive in its day but now it is a quiet place with few visitors. There are numerous temples that might be of more interest to someone doing research or a student of architecture. Visited Ayutthaya last year. Weird feeling seing a place so recent (just only 1760AD Ayutthaya was still triumphing). My question was "Why Alaungpaya Clans burnt down Ayutthaya?". Who was the benefactor of the downfall of Ayutthaya?" Alaugpaya was a nobody who seized power and united Burma for British colonization of Burma right after General Taksin chased them back. Tak Sin was later changed by the Chakri. The Chakri were the British babysit dynasty. Ayutthaya trade dominance of the SEA region was replace by the trio British "Straits States" of Penang, Malacca and Singapore. ....Ooops the British got Burma to themselves, made and baby-sit the Kings of Thailand....and got ports to dominate trades in the region. The British East Hindia Company was the ones that burnt Ayutthaya! Outstandingly beautiful! It is actually one of the reasons I took a trip to Bangkok in the first place. The ruins really takes you to the ancient times... still well maintained so that you could feel that you're in the different lifetime when visitiing.. The stone craft detail is just beautiful.. Words couldnt do it justice..
hello, my husband and I with our three kids went to Ayuttaya in August 2006. We had a great two days there exploring the ruins of the old city, It was a very peaceful and spiritual feeling kind of place. We loved it, it was just beautiful, the ruins the park and the thai people are very welcoming and lovely..we hope to one day return. 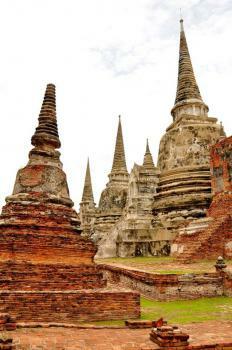 I feel proud of my country for the great and long history especially Ayutthaya City. 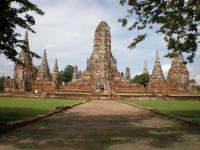 I and my family visit Ayutthaya every school's vacation. I like to visit the temples in order to respect the old historic image Buddha. Whenever I went there it made me feel that I had been in the Ayutthaya period again for the imagination to the brave kings fighting the enemies on the head of their elephants among the brave Thai soldiers for protecting the freedom of Ayutthaya. It will be your special day if you like to visit the ancient things or places. This historic city appropriates for being on UNESCO's World Heritage List. Please visit here, it is not far from Bangkok. You can travel by passenger-boat along Chao Phraya River or by car or bus on Phrahon Yothin Road. You won't find it disappointing. Fusion: "All buildings were elegantly decorated with the highest quality of crafts and mural paintings, which consisted of an eclectic mixture of traditional styles surviving from Sukhothai, inherited from Angkor, and borrowed from the 17th and 18th century art styles of Japan, China, India, Persia and Europe, creating a rich and unique expression of a cosmopolitan culture"
Zheng He: Zheng He travelled up the Chao Phraya river to the Siamese capital on 3 occasions. A statue of him stands today in the city. Name changes: From "Historic City of Ayutthaya and associated historic towns" to "Historic City of Ayutthaya". Done in 2006, to correct an error at inscription. 306 Community Members have visited.